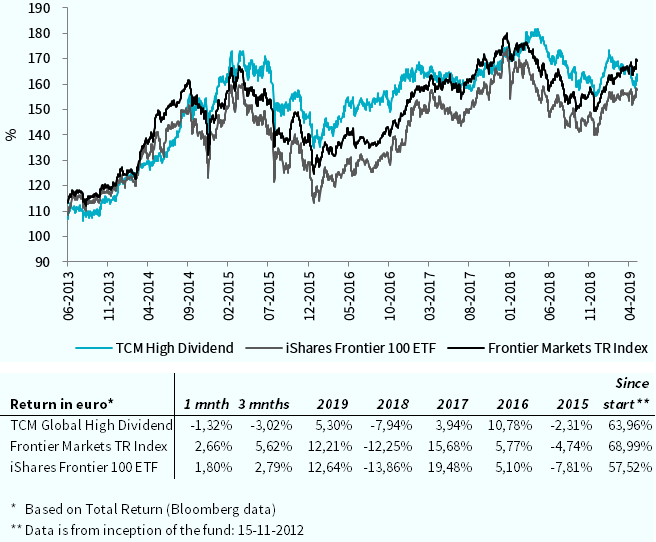 TCM Global Frontier High Dividend Equity invests in stocks listed on the local exchanges of the Frontier Markets Universe. To set up the portfolio the fund will make a selection of countries on the basis of quantitative and qualitative screening. By using these selection criteria the fund will have a diversified portfolio invested in several countries and sectors. The equally weighted portfolio will be re-weighted and re-allocated on a periodically scale. 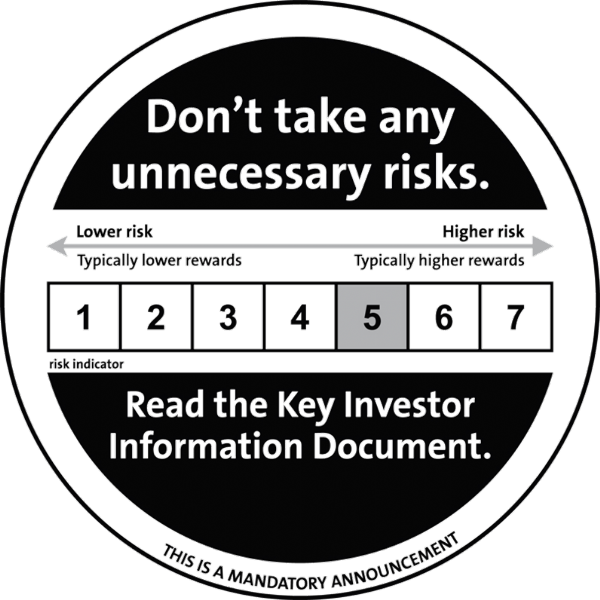 The risk profile is high, due to investment in equities and Frontier Markets. In principle, the fund will pay out dividend twice a year with an expected dividend yield of approximately 5% per annum. To achieve its objective, the Fund invests 95% to 100% of its total assets through TCM Investment Funds Luxembourg in units of TCM Global Frontier High Dividend Equity (Lux). The Fund qualifies as feeder-structure. Frontier Markets ended the first quarter positively. 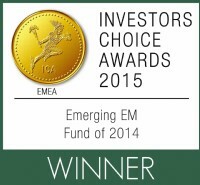 The FM index rose by 9.07% and the fund went up by 7.22%, both measured in euro on the basis of total return. Due to the strong rally in Kuwait, where the index rose 13.72% during the first quarter, the fund was unable to keep up with the index. The country has a weighting of 25% in the index, while the fund has a weighting of 2.67% in Kuwait. Partly because of the relatively high valuation in Kuwait, where the price-earnings ratio (P/E) is on average 16.8x, only a few shares are able to meet the criteria of our selection model. The average P/E of the positions in the fund is currently 9.84x. The rise in Kuwait is more technically driven, namely that renewed enthusiasm has arisen about the possible re-classification of the country from Frontier to Emerging markets. One of the largest index providers hinted that the country meets all requirements. The official announcement will follow in June. Kuwait actually never fitted well into the FM universe given the low population, high income level and lack of structural growth potential. This is in contrast to Pakistan for example, which became upgraded to the EM index last year with only a 0.2% weighting. Many fund managers therefore still regard Pakistan as a Frontier Market. The same applies to the TCM fund, which has a weight of 7.34% in the country. Pakistan is currently one of the cheapest markets in the universe. The Karachi Stock Exchange 100 index records only 8.6x the expected profit with a dividend yield of 5.7%. This index fell by 0.65% in euro over the past month. However, most of our holdings in Pakistan returned positively this month with outliers like Indus Motors (+ 9.11%), Millat Tractors (+ 8.69%) and Nishat Chunian Power (+ 8.30%). The fund currently has (equal weighted) positions in 83 shares across 22 different countries. The countries with the largest weightings are currently Vietnam (11.79%), Nigeria (9.51%) and Bangladesh (7.84%). At the moment these are the most interesting high dividend shares that meet the quality requirements. This weighting is therefore mainly determined by the relative attractiveness of the market compared to the other countries. The composition of the fund can therefore deviate strongly from the benchmark.